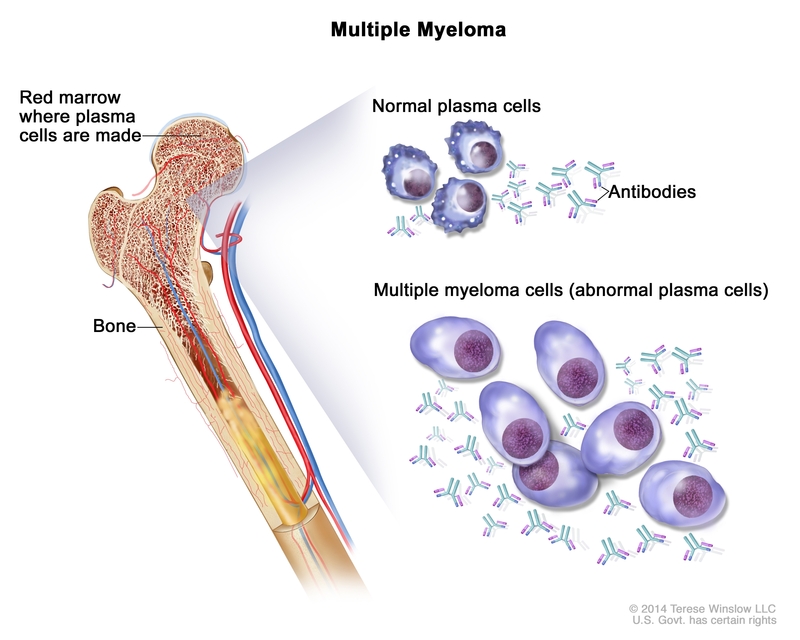 One of the most common forms of cancer in the hematologic system is Multiple myeloma (MM) which affects plasma cells, a type of white blood cell that produces antibodies. With advanced symptoms bone pain, bleeding, frequent infections, and anemia may occur. In studies, Pterostilbene has shown anti-inflammatory (1) and anticarcinogenic properties which has led to the improved function of healthy cells and the inhibition of malignant cells (2)(3). So far its anticarcinogenic action has been reported for lung, breast and prostate cancers. Today we will look at the latest research showing how it could be used to treat cancer patients. 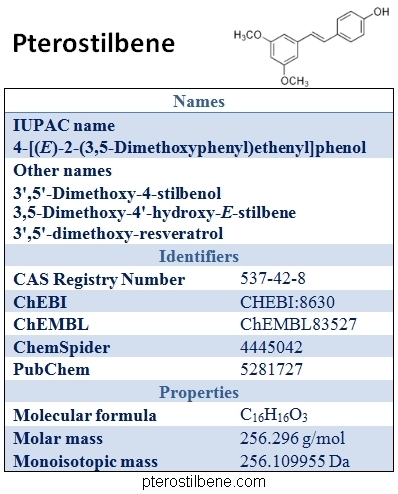 As we already explaining through this dedicated website, Pterostilbene is a naturally occurring dietary compound, first discovered in 1977 by Langcake and Pryce (4). Pterostilbene is chemically related to resveratrol but with better bioavailability due to the presence of two methoxy groups which cause it to exhibit increased lipophilic and oral absorption (5). In animal studies, pterostilbene was shown to have 80% bioavailability compared to 20% for resveratrol suggesting it is a superior choice in direct comparison (6). Researchers discovered Resveratrol could inhibit the growth of MM cell line as well as increasing the effect of apoptosis inducing drugs bortezomib and thalidomide helping to reduce the chemotherapy resistance of MM (7). Knowing that pterostilbene was a chemical cousin to resveratrol with better bioavailability researchers wondered if it could do better. A series of in-vitro and in-vivo experiments were carried out to test the hypothesis, could Pterostilbene improve on the Resveratrol results? The results are very exciting and were published in November 2016 in the International journal of molecular sciences (8). So let’s take a look at the research data and examine the results and see if we can make a solid conclusion. Using incremental doses of pterostilbene researchers measured proliferation in multiple MM cell lines (H929, ARP-1, OCI-MY5 and RPMI-8226) at 24, 48 and 72 hour time points. The results were very interesting indeed, here are the cell line measurements from the experiment after 48 hours. Fig 1. Pterostilbene (PTE) inhibits the proliferation of Multiple myeloma (MM) cell lines. (A) MM cells (H929, ARP-1, OCI-MY5 and RPMI-8226) were treated with PTE (10, 20, 30, 40 and 50 μM) in 96-well plates for 48 h; and (B) MM cell lines were treated with PTE (30 μM) in 96-well plates for 24, 48 and 72 h. Cell counting kit (CCK)-8 was used to monitor the cell proliferation. 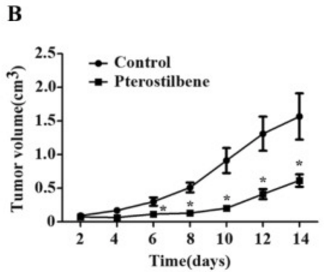 As you can see in the above, treatment with pterostilbene reduces MM cell proliferation with increasingly robust inhibition the higher the dosage. Next the team tested the influence pterostilbene had on apoptosis in the target MM cells, they used the H929 cell line for this particular phase. It would have been ideal had they tested the other cell lines they tested in the first phase, but even given that limitation the results are still interesting. Researchers wanted to confirm if there was an increase in the level of apoptosis given the level of inhibition they had observed across all cell lines in the first phase of the test. Sure enough the level of apoptosis did increase in a time-and dose-dependent manner which makes sense. We can see from the data that apoptosis was increased at 48h in the 10 μM dose with 14.09%, for the 20 μM dose with 22.91% and for the 40 μM with 54.87% Over the course of 72 hours the increase in apoptosis for the 40 μM dose group was even higher at an amazing 71%. With the control group coming in at 6.36% in comparison to this shows a big difference. The researchers concluded that the level of apoptosis increased due to the presence of elevated levels of cleaved caspase-3, cleaved caspase-8 and cleaved caspase-9, this suggests that pterostilbene induces both extrinsic and intrinsic apoptotic pathways. In order to further confirm this the team then used a pan-caspase inhibitor to block apoptosis of the same H929 MM cells after treating them again with pterostilbene. Sure enough when they did this the effect of pterostilbene was greatly reduced. Next the team examined mitochondrial membrane potential after treatment and saw a reduction in the pterostilbene group of 32.34% versus 11.61% in the control group. They also discovered that pterostilbene increased the activation of extracellular regulated protein kinases (ERK) 1 & 2 and also c-Jun N-terminal kinase as part of the increased induction of apoptosis. Even better the treatment has no effect on normal blood cells, which suggests that pterostilbene could be an ideal and safe treatment for MM. The team then implanted the H929 cells into non-obese diabetes/severe immunodeficiency (NOD/SCID) type mice. They then injected two animal groups with pterostilbene or a control substance at 50 mg per kg of animal weight for fourteen days. The chart above shows how the researchers measured in-vivo tumor volume over fourteen days and that pterostilbene treatment shows an impressive reduction of tumor growth rate and volume. As if that was not impressive enough, there has now been another study for B-cell lymphoma using pterostilbene (9) with similar impressive results (10), as well lung cancer again with similar results. Truly pterostilbene appears to hold great potential that researchers are only now really starting to unlock. Taken together, the results of these studies suggest very strongly that pterostilbene has clear anti-tumor effect on Multiple Myeloma cells and could be the basis for a new therapy for this disease. Given that pterostilbene has excellent half life and superior bioavailability compared to resveratrol the case is compelling to include pterostilbene in your supplement regime as a cancer preventative. (1) Choo, Q. Y., Yeo, S. C. M., Ho, P. C., Tanaka, Y., & Lin, H. S. (2014). Pterostilbene surpassed resveratrol for anti-inflammatory application: Potency consideration and pharmacokinetics perspective. Journal of Functional Foods, 11, 352-362. (3) Remsberg, C. M., Yáñez, J. A., Ohgami, Y., Vega‐Villa, K. R., Rimando, A. M., & Davies, N. M. (2008). Pharmacometrics of pterostilbene: preclinical pharmacokinetics and metabolism, anticancer, antiinflammatory, antioxidant and analgesic activity. Phytotherapy Research, 22(2), 169-179. (4) Langcake, P., & Pryce, R. J. (1977). A new class of phytoalexins from grapevines. Cellular and Molecular Life Sciences, 33(2), 151-152. (5) Perečko, T., Drábiková, K., Račková, L., Číž, M., Podborská, M., Lojek, A., … & Jančinová, V. (2010). Molecular targets of the natural antioxidant pterostilbene: effect on protein kinase C, caspase-3 and apoptosis in human neutrophils in vitro. Neuroendocrinology Letters, 31(2), 84. (6) Kapetanovic, I. M., Muzzio, M., Huang, Z., Thompson, T. N., & McCormick, D. L. (2011). Pharmacokinetics, oral bioavailability, and metabolic profile of resveratrol and its dimethylether analog, pterostilbene, in rats. Cancer chemotherapy and pharmacology, 68(3), 593-601. (7) Sun, C. Y., Hu, Y., Guo, T., Wang, H. F., Zhang, X. P., He, W. J., & Tan, H. (2006). Resveratrol as a novel agent for treatment of multiple myeloma with matrix metalloproteinase inhibitory activity. Acta pharmacologica sinica, 27(11), 1447. (8) Xie, B., Xu, Z., Hu, L., Chen, G., Wei, R., Yang, G., … & Zhang, Y. (2016). Pterostilbene Inhibits Human Multiple Myeloma Cells via ERK1/2 and JNK Pathway In Vitro and In Vivo. International Journal of Molecular Sciences, 17(11), 1927. (9) Kong, Y., Chen, G., Xu, Z., Yang, G., Li, B., Wu, X., … & Chang, G. (2016). Pterostilbene induces apoptosis and cell cycle arrest in diffuse large B-cell lymphoma cells. Scientific Reports, 6. (10) Schneider, J. G., Alosi, J. A., McDonald, D. E., & McFadden, D. W. (2010). Pterostilbene inhibits lung cancer through induction of apoptosis. Journal of Surgical Research, 161(1), 18-22.